Now there are many more reasons to visit the Khao Kheow Open Zoo. Thailand is blessed by several beautiful species and wildlife enthusiasts are always thrilled to visit such amazing place. Last Friday there was another surprise for the visitors of Khao Kheow Open Zoo with the addition of baby squirrel monkey. 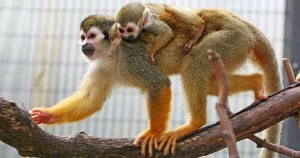 Just as baby kangaroo baby squirrel monkey clings to their mother’s back in their early childhood days. These cute baby squirrel monkeys are vastly found at Central America. Nature of baby squirrel monkey is a bit shy and they are often found skidding around trees and rocks in the forests. These Monkeys have length of about one foot and their tail is also about the same size. Baby squirrel monkeys are diurnal which precisely mean that they are active during the daytime. The newly arrived baby monkey squirrel becomes our fifth member to the Khao Kheow Open Zoo. The diet of babies includes fruitsand honey. An average baby monkey squirrel stays about 30 feet above the ground. Baby squirrel monkeylargely spendshours on trees by hanging by their long tailsby swinging from one tree to another tree. This cute looking baby monkey squirrel is already attracting many visitors. Visit Khao Kheow Open Zoo to experience more of thrills and fun of wildlife.